Opening a book is like opening a box of exciting thoughts and creative imagination just waiting to be devoured… Many avid readers will tell you so. As for me, I couldn’t agree more. The pure joy of owning a freshly-bought and clean book with crisp pages cannot be replicated. Ever. Over the past month I’ve read about 3 eBooks on my iPhone and it has been an uncomfortable experience accompanied by headaches, eye aches, sore arms and a constant low battery power. The only reason I persisted with reading so many is because I have this urge to complete a trilogy once I’ve started with it (regardless of the medium). I will always prefer print books over eBooks for a few easy reasons: the smell of the pages drive me crazy with excitement; tangibility – hold tightly or cradle lightly; safety aspect (if you drop the book it won’t break, right? ); and accessibility – I don’t need to ensure the book has enough battery power to let me read it for hours on end! 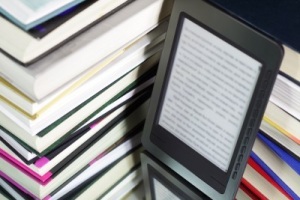 While the biggest advantages of eBooks rest with convenient storage and the ideal option for travelling, I think there’s some kind of emotional journey and attachment that’s associated with a novel/book when you physically hold it to read it and are familiar with the scent of its pages. My personal experience is a testament to this. I love love LOVE the smell of books! But I now find myself much more glued to my eReader(Kobo Touch) these days – purely because of the convenience of it. It’s small, light, has no glare (AMAZING e-ink) and I only have to charge it once every 2 months with daily reading. Reading from a tab or phone is too painful. That’s amazing! 🙂 What would you say is the biggest plus for you, when using a tablet for ebooks?